When it comes time to replace your old water heater, there are a lot of different options on the maket. These choices include everything from the old-fashioned gas or electric ‘storage’ tanks, that sit in the garage or a closet like a huge squatting tea-kettle, to the newest solar, geothermal or heat-pump water heaters that rely at least partially on other, more exotic forms of energy. Another option, one that Petersen Plumbing is seeing more and more often in the market today, is the tankless water heater, sometimes called an on-demand water heater. This water heater hangs on your wall and, instead of storing a large tank of water that is kept constantly hot–even when you’re asleep or not at home–the tankless water heater produces hot water only when it’s needed, as it’s needed. These steps may have a more immediate effect upon your energy usage than installing a tankless water heater will. Do you want a tankless water heater? But, of course, tankless water heaters do make economic and logical sense in some circumstances. If you’re adding on to your house, or remodeling an existing space, adding a second water heater closer to the fixtures can save the time, wasted water, and lost energy that it would take for hot water to move through a long, cold pipe from the old water heater wayyyy over on the other side of the house. The closer a water heater is to the point of use, the less energy and water is wasted every day! And obviously, tankless water heaters take up much less space than the hulking behemoth of an old fashioned storage water heater. If space is at a premium, definitely at least consider going tankless! It will help you maximize the space you have. Petersen Plumbing does not recommend tankless water heaters in locations with hard well water, or where galvanized steel pipe is present either in the building, or in the water service to the building. 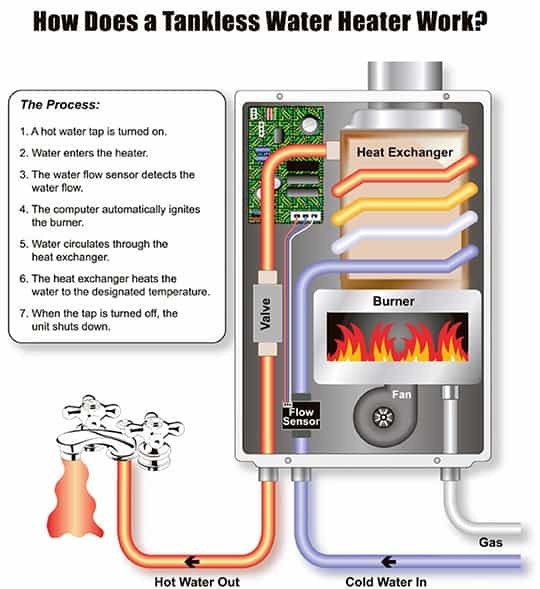 As this diagram from ShowerInsider.com shows, the issue is in the underlying physical design of a tankless water heater. Rust and mineral buildup in the heat-exchanger will reduce the efficiency of the water heater and can block it totally. A tankless water heater doesn’t have a cushion of already heated water to rely upon, it must stand ready to produce anywhere from 0.5 gallon to 5 gallons of hot water (and even more!) a minute. And it must be able to do this almost instantaneously. A properly sized electric tankless water heater can do this, but to do so it puts a large surge of demand on your electric service. The rest of the electronic equipment in your house probably isn’t going to be too happy with sudden surges or brown-outs whenever the water heater kicks in and out. There are ways to work around this, to prevent the sudden surges and brownouts, but they’re rarely cheap. We prefer gas-fired tankless water heaters, for this reason. Whether you decide on a gas or electric tankless water heater, you will need to plan your installation. You need a heater that is properly sized, so that it can comfortably handle your usage patterns. (And what happens if and when the usage patterns change in the future?) Your new heater needs to be able to meet the peak demand in gallons per minute that you expect over the course of a day or a week. How many people will be in the house at one time, how many fixtures will be demanding hot water at one time? How many gallons per minute is that, at peak use? That figure is what you need to plan for. What is the average ground-water temperature in your area? (For a very rough, off-the-back-of-the-envelope calculation in the Eugene & Springfield area, assume an average ground-water temperature of 52F.) Subtract that figure from 120F to get the required temperature rise in degrees F that your water heater will need to provide. The colder your ground water is on any particular day, the harder your water heater will have to work to produce hot water at 120F at the fixture. Parts of the country with colder average ground-water temperatures will need to plan for a more powerful tankless water heater. After all, lukewarm water defeats the entire purpose of the installation! If you decide on an electric tankless water heater, you need to make sure that the proper connections exist for the planned location. You may need to upgrade your electrical panel, or even your entire electrical service! If you are installing a gas system, do you have gas already piped to the installation location? Can you vent the new water heater properly and safely? And, of course, we see many tankless water heaters being installed in a new location in the home or structure. Do you have an adequate cold water supply at that location, to feed the new heater as well as whatever the cold water needs will be at the fixtures? Tankless water heaters are becoming quite common these days. The building and repair industry is gaining experience with them, with their advantages and disadvantages in particular situations. They’re not the best, most economical fit for every situation, but when they do meet your requirements, they are a viable, useful, and economical option. So give us a call at 541-343-9339, if you’d like to discuss tankless water heaters with one of our skilled plumbers! Water heaters have changed a lot in the past few years! Read about the new Federal Water Heater Energy Efficiency Standards and how they affect you. Green Building Advisor - Are Tankless Water Heaters a Waste of Money? The new Federal Water Heater Energy Standards have produced a burst of energy in new water heater design and technology. Here's a cool Infographic from the U.S. Department of Energy.